As soon as he arrived at the Manila airport, Pres. Rodrigo Duterte immediately took the liberty to explain the reason behind the Palace's decision to nullify the amnesty given to Trillanes back in 2010. This, after the President's fruitful business trip in Israel and Jordan. With some lawyers calling it an indication of political persecution, reports on the President's amnesty revocation flooded both mainstream and social media as it seemed to be unprecedented and controversial. However, there were reports that entail the same events where a particular person's amnesty had been revoked. Thus, this is not the first ever occurrence of this scenario in the world since it already happened in some countries like the United States of America and Norway. Upon the President's arrival, he made clear in his speech that it was Solicitor General Jose Calida who found a probable cause to revoke Sen. Antonio Trillanes IV's amnesty that was given by the former President Noynoy Aquino. SolGen Calida was also the one who filed a quo warranto case against the ousted Chief Justice Maria Lourdes Sereno and eventually won. Calling the SolGen as 'medyo bright na matino', Pres. Duterte mentioned that when SolGen Calida, being the government lawyer, tells him there is something wrong that has to be corrected, he cannot refuse. "Kapag sinabi ni SolGen na may mali and this have to be corrected. I cannot refuse. He is the government lawyer. Kung anong sinabi ni [SolGen] Calida, 'yun ang paniniwalaan ko", he said. In addition, the President stated that the Senator, who is one his strongest critics, "did nothing for the military". "He did not only abandon the vision of the military he became a corrupt guy", he added. For him, the Nacionalista Party Senator only maintained a facade that he is "all for the military" but "he never gave a hoot". Questioning the Senator's sincerity of being pro-military soldier, he asked: "Nagpakita ba sila (Trillanes) sa Marawi when my soldiers were dying? Anong naibigay niya sa military?". "It was all Trillanes pretending to be a crusading soldier when as a matter of fact, wala naman silang ginawa", the enraged President continued. He also tackled the possible chaos that may soon take place as a result of this dilemma. "Kung magkagulo dahil kay Trillanes, ay diyan talaga ako hindi bilib", he said. Emphasizing how worthless of a soldier the Senator is, for him, he recalled what Trillanes allegedly did. "Kinalimutan niya mga kasama niya doon because they believe in his word. Ano bang nagawa niya sa military na parang magpakamatay sila? ", he reiterated. Expressing his disappointment at the likes of Trillanes, he said, "If that is the kind of culture 'yung mga military natin, I would rather not be President". Later, he shared that there are people who are out to overthrow him. "I’m called upon by many left organizations, I will show you tatlo 'yan. Tatlo 'yan na praying for my ouster", said Pres. Duterte. "Yung tatlong iyan ang bantayan niyo. Yang tatlong yan konektado lahat iyan. 'Yung kay Trillanes, he is also playing with the CPP. Pero alam ko na gusto nilang pumasok sa PMA", he added. According to the 73-year-old President, if the military are similar to Trillanes, he will better go home and spend time with his grandchildren. On the other hand, he also discussed that whether or not the Supreme Court will uphold his decision on Trillanes' amnesty revocation is something he will leave at the high court. "Pending orders on arrest without arrest warrant: Nandiyan na sa SC, I leave it at that. If the SC will say that my proclamation is null and void then let it fall. But if I’m affirmed or sustained, then it’s the military now", the Chief Executive said. Read the complete transcription of Pres. Duterte's speech below to know why it is only Trillanes' amnesty that has been revoked. -On loyalty check on military: Right at the beginning of my term as President, I always stressed to uniformed men of government that they should not nurture in me or any of my Cabinet loyalty. I said you should f focus your loyalty to the flag. -What will follow ay hindi ko na problema, impeachment, mutiny, kudeta. Bababa ako, why would I sacrifice the lives of people? For me to order to shoot each other, I will not do it. Maghanap na lang kayo ng ibang President. -Time and again, I said, huwag kayo tumanaw ng utang na loob sa akin. You deserve what you have or got now. -Iyong kay Trillanes iyong nag-research is si [SolGen Jose] Calida just like Sereno. Si Calida medyo bright na matino. -Kapag sinabi ni SolGen na may mali and this have to be corrected. I cannot refuse. He is the government lawyer. Kung anong sinabi ni [SolGen] Calida, 'yun ang paniniwalaan ko. -As a lawyer, you will ask me, and what is your basis, I cannot discuss with you the merits, but what I can say is in the matter of granting pardon pati amnesty is a constitutional mandate of the President. -Wala doon kay Calida, pero ito noon pa, the power to pardon and the power to grant amnesty with the concurrence of the Congress is a presidential power. It cannot be delegated to anyone else. -Ito ngayon ang problema, it was Gazmin or one of those who investigated the case 'yung kudeta pati rebellion, then he recommended for the amnesty ng lahat. -Ang problema diyan may mga requirement and one of that is you have to do it in a particular office in the Armed Forces of the PHL organization and it must be J1, administrative. -We never started the ruckus. -Trillanes did nothing for the military. He did not only abandon the vision of the military he became a corrupt guy. 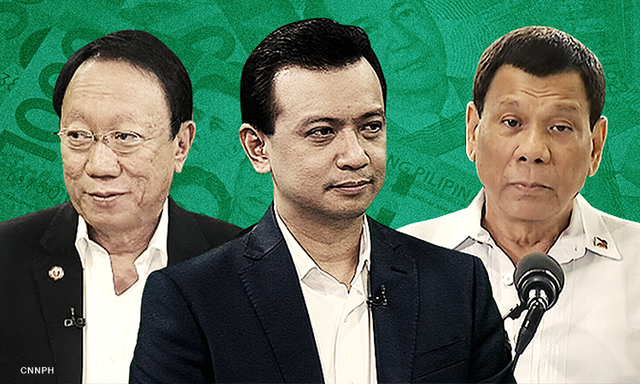 -Itong si Trillanes sundalo and nag-make believe siya sa mga sundalo na he was all for the military and he never gave a hoot. -Nagpakita ba sila (Trillanes) sa Marawi when my soldiers were dying? -Anong naibigay niya sa military? -I am ready to step down, anytime. -It was all Trillanes pretending to be a crusading soldier when as a matter of fact, wala naman silang ginawa. -Si Volts, he recommended that a general amnesty be given and after his recommendation he approved it. Siya mismo ang nag-grant. Siya ang nag-recommed, siya ang nag-grant. What is the crime of Volt? Usurpation of authority. -Let the court decide on it. Whether he goes back on jail. -Before you can give a pardon or amnesty, you have to declare your guilt and place on a narrative para alam namin kung ibibigay o paniniwalaan ang amnesty. -'Yung application niya sa SC, nagbigay siya ng sample ng affidavit. You have to swear and place a narrative, saan and ano ginawa mo kung bakit ka papatawarin. -Failure to comply, it must be in an affidavit form. Iyong nag-imbestiga at ang recommend nga ng amnesty siya rin ang nag-approve. -You pardon criminals in country and you delegate to just somebody. Parang ginawa nila ang gobyerno na laruan. And now if the SC sees that my proclamation is invalid let it fall. -I’m called upon by many left organizations, I will show you tatlo 'yan. Tatlo 'yan na praying for my ouster. -I’m sticking to what is right and constitutional. -She (De Lima) was able to convince the world na prisoner of conscience siya. -'Yung tatlong iyan ang bantayan niyo. Yang tatlong yan konektado lahat iyan. 'Yung kay Trillanes, he is also playing with the CPP. Pero alam ko na gusto nilang pumasok sa PMA. -Guilt is personal whether your are a PMA-er or ROTC or reserve. Guilt kung mayroon man sa kanila personal yan. -Kung magkagulo dahil kay Trillanes, ay diyan talaga ako hindi bilib. -Kinalimutan niya mga kasama niya doon because they believe in his word. Ano bang nagawa niya sa military na parang magpakamatay sila? -If that is the kind of culture 'yung mga military natin, I would rather not be President. -Everybody, we get our money from the people’s pockets. It’s not about institutions, it’s about being of service to your fellowmen. -If Trillanes can define my character 10 times as bad eh kayong Pilipino should decide. -Gusto niyo ng ganoong military? uwi na ako sa amin. I better off spending time with my grandchildren. -In the first place ang amnesty was void therefore he getting out of custody is also void, the amnesty if deffective, fatally flawed. -Nothing valid can come out from a void document. -Pending orders on arrest without arrest warrant: Nandiyan na sa SC, I leave it at that. If the SC will say that my proclamation is null and void then let it fall. But if I’m affirmed or sustained, then it’s the military now. -Sa kanila bahala sila kung ayaw nilang tanggapin. You can now invite everybody not to respect the law anymore. -On pursuing court martial: No. Wala namang naniniwala. -They have alliances and we have evidence to prove it. 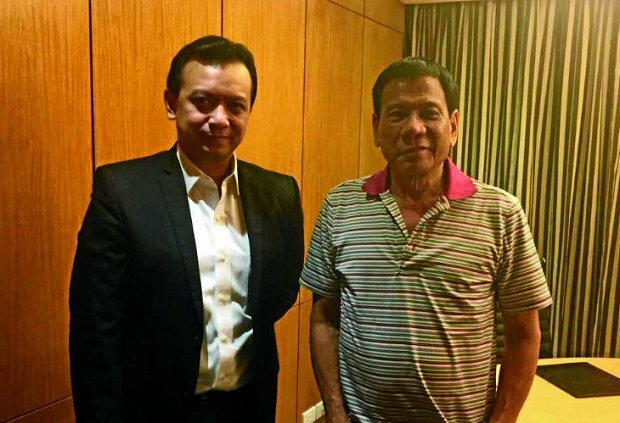 -Magsabi si Trillanes bakit ako lang, karami namin pumasok sa kudeta. It’s the President’s prerogative.